Locksmiths have long used the “lock bumping” technique to gain access to locks when a key is not present. The term “bumping” comes from the fact that a specially cut key is inserted into a keyhole and then tapped or “bumped” by a screwdriver or other object. This bumping forces the pins in the lock to jump to their shear line, and with a little torque applied to the key, the lock will open. With the advent of the internet, this technique was made generally available and sadly, companies are selling the specially cut keys online. Anyone with an internet connection now has access to the technology and tools needed to gain entry to your home. When a bump key is used there is no sign of forced entry or damage. Are your locks already bump protected? Check your deadbolts for the markings in the photo. If you have them, you’re protected. Take your door locks to a locksmith shop. Locksmiths can install special pins that make it much more difficult, though not impossible, to bump a lock. This is an affordable way to protect your home from lock bumping. If taking your locks to a shop is not possible, the locksmith can come to your home for an additional service charge. Install ACME’s #1 Recommended Home Security Tip. For less than $30 you can easily secure your door so that bumping is impossible. Or install an inexpensive Pick-Proof / Bump-Proof Secondary Deadbolt. Install Residential Bump Resistant Locks called the Kwikset Smartkey. You can see them on Amazon here. Your local locksmith will also carry and install them for you. Replace your locks with a light commercial grade locks. If you have Schlage locks, this is your least costly solution. Schlage’s light commercial grade locks are heavy duty, pick and bump resistant, and built solid. You can find those on Amazon here. There is a difference between what you get when you buy this lock online and what you get when you buy from a locksmith. Locksmith locks are a significant step up from what’s offered at home clubs and thus are only available at lock and security shops. There are NO plastic parts in the locksmith version, but they are a bit more expensive. Once purchased you can replace the existing locks yourself. For most homeowners, the online version of the Schlage 560p lock is good enough to resist lock bumping. Install high-security bump and pick resistant locks. We recommend the Mul-t-lock brand for its strength, resistance to attack, and additional security features not available in other high-security locks. You can read about high-security locks including Mul-T-Lock, High Security Locks on Our Website Here. You can buy them on Amazon here. You local locksmith can help you with all of your installation needs. Call ACME Locksmith today to learn more about protecting your home or schedule Phoenix Locksmith service online. I’m the owner of Acme locksmith in Mesa Arizona. Today we’re going to talk about lock bumping, what it is and how people can get into your home using this technique. We’re also going to highlight several products to protect your home so that somebody can not use a bump key to get into it. Lock bumping is a technique that locksmith used to unlock houses for many years, but unfortunately when the internet came into being somebody put the information out there online for anyone to see, Nowadays anyone with three dollars an internet connection could actually get the necessary and the training necessary to use this technique to bypass your home’s locks. Let me demonstrate now. Here’s my key that’s actually designed to work this lock. Now this is my bump key. This is a key that anyone can buy online for about three dollars. Now the thing about a bump key is it won’t actually turn the lock until you give it a good hard smack. Now let me try to position myself so you can see me do this…and there it goes the lock opened. I haven’t shown you anything that anybody can’t find online already but it would be very irresponsible me if I didn’t show you how to protect yourselves against this type of technique. So let’s talk about products available on the market to protect your home from lock bumping. I’m going to go in order of least expensive to most expensive. Now a new product that we really like is actually just a simple strap [NOTE: THIS PRODUCT HAS BEEN REPLACED BY AN EVEN BETTER ONE SHOWN HERE!] that secures on the back of your deadbolt and your doorknob and what it does is, it will actually lock this deadbolt in place so that even if you have a working key nobody can turn and open the lock. We really like this product because it costs less than twelve dollars and you can implement it anytime you’re inside your home. Here in Arizona we go in and out of our houses through the garage. So you can leave this product installed on your front and back door so that nobody can bump those locks while you’re out of the home. Here we are with the key that’s actually designed to work this lock. Now remember this is the easiest way to open any lock and this strap will actually stop not only lock bumping but stop a working key from opening the lock. Now I’m going to install my strap, and I’ll show you how this is done in just a minute. It’s stops the thumb turn from turning so that nobody can get into the home. Now that my strap is on, it takes about ten seconds to put on. It’s very very quick now take a look at this. This key is no longer turning this deadbolt. I’m going to ply a little force here. I didn’t want to snap it all the way off but I wanted to show you that this key would break before that strap gives way to anybody can open your door. It’s a great product we love it’s brand new to the marketplace. This is not a trick. This is a working key for this lock and, there you go, I’m going to show you how strong this is you’ll snap the key off before the lock opens. Now let me talk to you about a Kwikset product. Kwikset products aren’t very heavy-duty, but to stop lock bumping they’re one of the best residential products on the market right now. Let me show you this product it’s called the Smartkey by Kwikset. 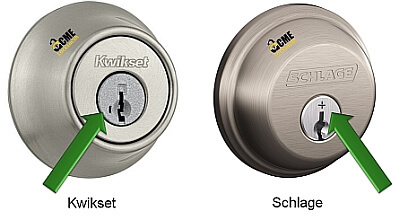 You can get prices for Kwikset Smartkey locks on Amazon here and all the major box warehouses. It’s different in that it uses wafers instead of pins, and lock bumping actually counts on the fact that you’re using pins to create a shear line. This is actually a waiver system. You can identify a smart key product because it has an additional hole right on the side of the cylinder. So if the locks on your house today have that little hole next to the keyhole you have a bump resistant product on your home. If you have regular Kwikset on your home simply replace the dead bolts that you have on your house with the Smartkey product. That deadbolt will be your bump resistant protection. Another product we really love is a half deadbolt. If you have another brand of Hardware on your house and you don’t want to replace all your hardware with the quick-set brand, because that’s very expensive to do, you can install half deadbolts on your doors, and a half deadbolt is just that. On the inside of the home there’s a thumb turn just like you’re used to always seeing, but on the outside of your home there’s nothing to indicate that there’s even a lock there so there’s no hole. No hole to put a screwdriver in. If an intruder was actually able to bypass your other locks the door still wouldn’t open, and they’d be sitting there baffled as to why. The half deadbolt needs to be professionally installed because of the door prep. The last thing I want to show you is a high-security product. They’re bump proof, they’re pic proof. They have the highest lock rating. It’s the most secure thing you can put on your home. High-security products take special keys and key ways. This is the reason why this lock is bump and pick proof. You can see this is not your standard house key. You would actually have to go to a lock professional to get this key copied. So if you do hand out keys to to your babysitter or your dog walker when they give that key back to you you know that they haven’t made a copy of it and your home stays secure. The reason we like the Mul-t-lock brand over the other brands of high security locks is because it has this very unique ball bearing feature on the actual deadbolt itself that will actually lock it into the receiver. That secures to your door frame so that you cannot separate these two objects from each other without considerable force. You can find Mul-t-lock product on Amazon. You will likely need a local locksmith certified in Mul-t-lock to do the installation of the product. So hopefully you’ve learned a little bit about lock bumping what it is how to protect your home. From the inexpensive less than twelve dollars strap that can comfortably secure you in your home to upgrading some of your locks to the Smartkey feature. Or if you don’t have the quick-set brand, going into a half deadbolt type of situation so there’s nothing on the outside of your door an intruder can attack. To your higher and high security which is the most effective but expensive way to protect your home.